IN THE WORDS OF THE WINNER – “I was out of control and Brad (Keselowski) was really good on the long run. I hate that he had problems, he was strong and we weren’t going to do anything with him, but then he lost the brakes or something. A little bit of a gift, but we have given some away, so it feels good to come out on the good end for once.” – Martin Truex Jr.
· Martin Truex Jr. won the 20th annual Kobalt 400 Monster Energy NASCAR Cup Series race at Las Vegas Motor Speedway Sunday afternoon. For Truex, it is his 8th victory in 408 Monster Energy NASCAR Cup Series races. It is his 5th win in the last 27 races dating back to last year. · It’s the earliest win in any of Truex’s 12 full-time Monster Energy NASCAR Cup Series seasons (2006-17). · In addition to taking the checkered flag today, Truex also won both Stage 1 and Stage 2, as he amassed 60 points towards the season standings today (10 for each Stage win, 40 for the race win). 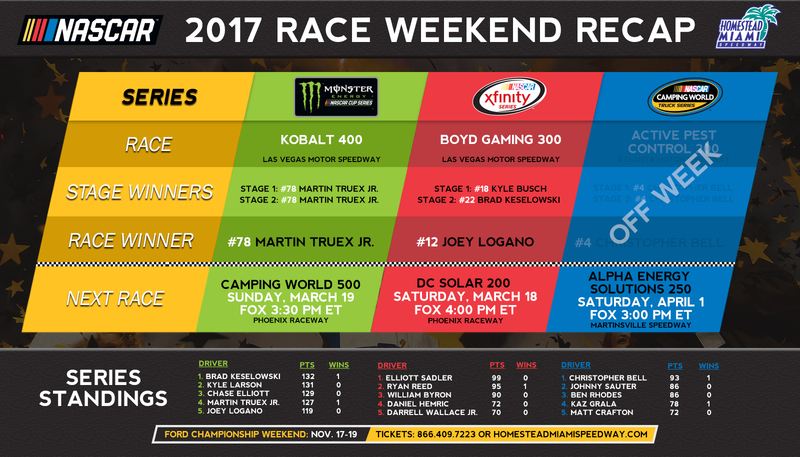 · It is Truex’s first victory and fourth top-10 finish in 12 career Monster Energy NASCAR Cup Series starts at Las Vegas Motor Speedway. 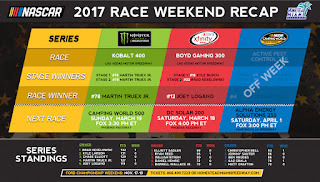 · Truex is the 12th different winner in 20 Monster Energy NASCAR Cup Series races at Las Vegas Motor Speedway. · Kyle Larson (second) posted his second top-10 finish in four Monster Energy NASCAR Cup Series races at Las Vegas Motor Speedway. It is the second straight race in which he has finished 2nd, having also done it last week in Atlanta. · Chase Elliott (third) posted his first top-10 finish in two Monster Energy NASCAR Cup Series races at Las Vegas Motor Speedway. · Erik Jones (15th) was the highest finishing rookie. · Brad Keselowski (132) leads the point standings by one point over Kyle Larson (131). They are followed by Chase Elliott (129) and Martin Truex Jr. (127). · With the win, Martin Truex Jr. becomes the third driver to qualify for the 2017 Monster Energy NASCAR Cup Series Playoffs, joining Kurt Busch and Brad Keselowski, winners of the first two races of the season. The Playoffs culminate with the Ford EcoBoost 400 championship finale on November 19 at Homestead-Miami Speedway. · In 12 career Monster Energy NASCAR Cup Series starts at Homestead-Miami Speedway, Martin Truex Jr. has posted seven top-10 finishes, including three top 5s. He posted a career-best finish of second in 2006. He also was part of the Championship 4 in the 2015 Ford EcoBoost 400 Monster Energy NASCAR Cup Series championship race, where he finished 12th. · Joey Logano won the 21st annual Boyd Gaming 300 NASCAR XFINITY Series race at Las Vegas Motor Speedway on Saturday afternoon. It is Logano’s 28th victory in 160 NASCAR XFINITY Series races. It moved him into 8th spot on the XFINITY Series all-time wins list. · Kyle Larson (second) posted his second top-10 finish in three XFINITY Series races at Las Vegas Motor Speedway. He now has finished in the top three in each of the first two XFINITY Series races of 2017. · Daniel Suarez (third) posted his third top-10 finish in as many XFINITY Series races at Las Vegas Motor Speedway. · Justin Allagaier (fourth) was the highest finisher among full-time XFINITY Series drivers, while Cole Custer (11th) was the highest finishing rookie. · Kyle Busch won Stage 1 and Brad Keselowski won Stage 2 of the Boyd Gaming 300. · Elliott Sadler (99) leads the XFINITY Series points standings by four points over Ryan Reed (95). They are followed by rookie William Byron (90), the winner of the 2016 Ford EcoBoost 200 Camping World Truck Series race at Homestead-Miami Speedway.